We discuss experiences employing a video-based mouse-replacement interface system, the Camera Mouse, at care facilities for individuals with severe motion impairments and propose adaptations of the system. 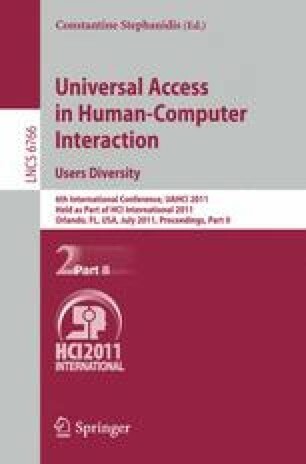 Traditional approaches to assistive technology are often inflexible, requiring users to adapt their limited motions to the requirements of the system. Such systems may have static or difficult-to-change configurations that make it challenging for multiple users to share the same system or for users whose motion abilities slowly degenerate. As users fatigue, they may experience more limited motion ability or additional unintended motions. To address these challenges, we propose adaptive mouse-control functions to be used in our mouse-replacement system. These functions can be changed to adapt the technology to the needs of the user, rather than making the user adapt to the technology. We present observations of an individual with severe cerebral palsy using our system.